Ethiopia spans most of the Horn of Africa, consisting of highlands that offer spectacular, off-the-beaten-path natural scenery. 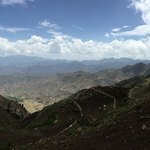 This tour covers one of the most impressive of such areas, the Simien Mountains. A World Heritage site formed by ancient lava flows, the Simien Mountains contain thousands of endemic species, a unique ecosystem, and Ethiopia's highest mountain, Ras Dashen (4,550m). Before venturing into the mountains, you'll first explore Addis Ababa and Gondar, Ethiopia's current and historic capital respectively. Then, you'll trek in the Simien Mountains up to the summit of Ras Dashen for over a week, before descending into Amhara villages in the surrounding lowlands. After over a week of both natural and human encounters, you'll return to Gondar, then Addis Ababa. This tour is best suited for thrill seekers looking to understand the culture and lifestyle of Ethiopia alongside an extraordinary, physically demanding trek. Welcome to Ethiopia! After arriving in Addis Ababa and completing entry formalities, a driver will be waiting for you to transfer to your hotel for accommodation. After settling in, you'll have time on your first day to wind down, rest, and explore a bit of Ethiopia's capital city. Go on a city tour, and if you like, visit a project supported by a local tour operator. In the evening, we will regroup and go out for dinner. Wake up and head to the airport for your domestic flight to Gondar, Ethiopia's capital until 1855. Once you arrive, you will discover a city full of historically significant architecture with diverse influences, including palaces, churches, and baths. You'll especially want to see Gondar's main highlight, Fasil Ghebbi. A UNESCO cultural world heritage site, Fasil Ghebbi is an intricate castle complex dating back to the 17th-century and the former residence of the Emperor. We will also make our way to the Church of Debre Birhan Selassie, where you will get to see its iconic ceiling decorated with painted angels. 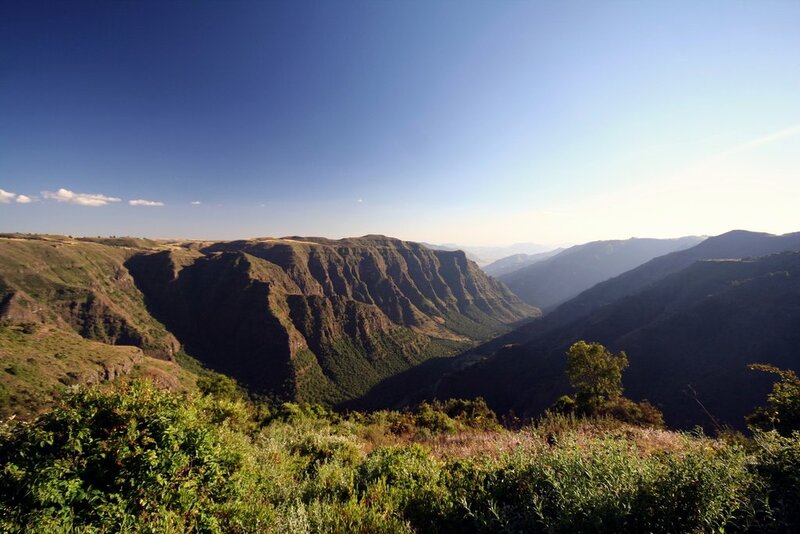 Board a private vehicle and travel 100 km north across the Ethiopian highland to Debark, a small city of about 30,000 inhabitants at the border of the famous Simien National Park. After a quick logistical stop at the headquarter offices to gather cooks and scouts, we will then drive out on a rough road to an imposing mountain plateau over 3,000m high. From here, your trek across the Simien Mountains begins! After 2-3 hours of walking, get your first glance of the impressive, dramatic landscape. Then, as night approaches, enjoy dinner prepared by our cook and spend the first night outdoors in the tents of the Sankaber camp. Next morning at Sankaber, meet your mules and drivers in charge of transporting your extra gear before commencing the trek to Gich. Then, pick up your pace and traverse an escarpment before dropping down for stunning views of the beautiful Jinbar Waterfall. From here, ascend through terraced farmland until you arrive at the village of Gich (3,600m). As the sun sets, head up to the Kedadit Mountain and watch as the twilight sky change colors until nightfall before heading back to camp. Start your day with a 2-hour climb to the summit of Imet Gogo (3,926m), one of the most beautiful vantage points overlooking dozens of rugged peaks. Then, trek up and down along another whole escarpment, walking through fields of giant lobelias and other fascinating highland foliage. Finally, ascend the peak of Inatye (4,070m) and reach camp Chenek in the afternoon (3,650m), where you can recover for the night. As the trek intensifies, you will continue over 700m through the Bwahit Pass (4,200m). If conditions allow, our climb will take us to the peak of Ras Bwahit (4,430 m), Ethiopia's third highest mountain, for more amazing high-altitude views. Next, descend to the village of Chiro Leba and the Mesesha Wenz river for a refreshing swim. After another hour uphill, you will arrive at your base camp for the night at Ambiko (3,250 m). Get up early before sunrise and leave camp by 4 AM for the longest and most strenuous part of the trek. Your ascent starts slow and gentle but gradually becomes more difficult as the altitude increases. For the last 50 meters of the stretch, you will get to manually rock climb vertically up the mountainside. Afterward, you will finally reach the summit of Ras Dashen (4,550m). Reward yourself with a stunning view of the entire Simien mountain range and watch as vultures, eagles, and other birds soar across the vast skies. Then, descend back to our camp at Ambiko. Take a break with today's trek, which will be more relaxed and cover a good amount of distance without drastic altitude changes. You will spend the morning traversing the expanse of flatland, passing by some small villages and locals working in the fields along the way. We will reach our camp at Sona by the afternoon (3,500m). 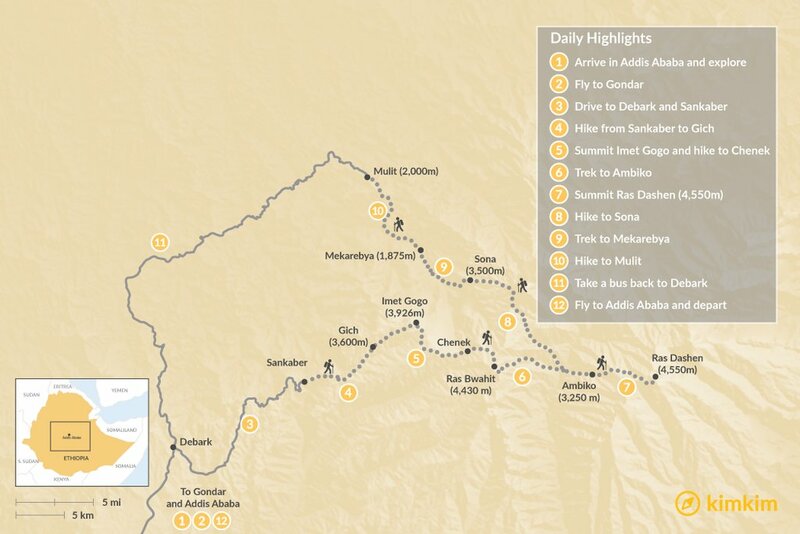 Today, we will go over the edge of the plateau and descend steeply more than 1,000m to the Ansiya Wenz. Very few trekkers head down into the lowlands, so this experience will give you the chance to explore another unique, little-known region. Here, you can bathe in the river while enjoying the pleasant, temperate climate of the lowlands. Your day draws to a close at the village of Mekarebya, where you can observe the water well built with the help of a local partner, interact with locals, and rest. Continue descending to the Ansiya River and take a short detour to a small valley, where you will uncover a scenic riverside pool inviting you for a dip. Then, ascend again 400 meters to Hawaza, a quaint village where we will stop for a coffee and tea break. From there, complete your day with a casual stroll to our last campsite at Mulit (2,000m). Congratulate yourself on finishing the trek, celebrate by a cozy fireplace, and watch the stars before heading to bed. After our last 2 hours of easy walking, you will reach the neighborhood of Adi Arkay adjacent to the main road. A bus will then drive you through Debark, passing by spectacular landscapes and rock formations. By the afternoon, you will arrive back at Gondar. 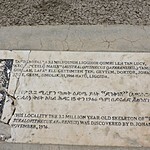 Transfer to the Gondar airport in the morning and fly back to Addis Ababa. If there is enough time before your departure, spend your last moments in the city to visit a market or shopping area and buy souvenirs. Finally, enjoy a farewell Ethiopian dinner complete with traditional music and a dance performance. Then, it's time to board your flight back and come back home with memories that will last a lifetime!